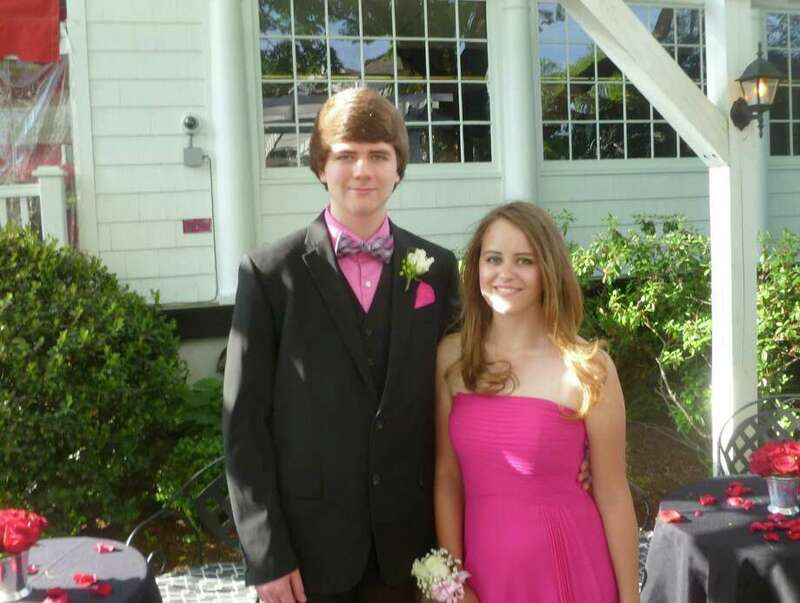 Peter Douglass, 17, of Redding, and Abby Morley, 17, a New Canaan High school senior pose for a photo outside the Roger Sherman Inn on Friday night before the Senior prom. New Canaan High School seniors and their dates showed off their promwear before the big event at a party at the Roger Sherman Inn on Oenoke Ridge early Friday evening. The party was hosted by Dean Wertz, New Canaan High School Class of 2015, and his mother, Nes Jaffre, a co-owner of the restaurant. While a spread of soft drinks and hor d'oeuvres were set out for the students and parents at the party and live music played, most of the couples lingered on the front lawn of the inn hugging and posing for photos being taken by their parents. Feelings about the end of high school ranged from wistful to excited to be moving on. Noting the large number of couples gathering at the party, Chloe DeMauro, 18, a senior who will be attending the University of Missouri to study broadcast journalism, said she thinks the NCHS Class of 2015 could be viewed as a closer knit group than some other previous classes. "We look out for each other," DeMauro said. Jimmy Fahey, 17, dressed in a white tuxedo, said he was going to take a gap year and work to save money to start school next year, where he hopes to play baseball. "I'm ready for high school to be over," Fahey said. Arriving at the party early, James Orphanos, 18, and his date, Kaitlyn Piotroski, said they were ready to have a good time at the prom later that night at the Stamford Marriott. "This is our last big get-together, so let's make it count," said Orphanos, who will attend Roanoke College.